First photo shoot with my studio strobes! I’m showing this top both tucked and untucked. I prefer wearing this top tucked. It is too boxy untucked, and does nothing for my figure. I’m wearing it with my Candice skirt. I swear my back is not crooked – I just forgot to straighten it out after tucking! I turned off the fill light for this one. All facings are topstitched in place. 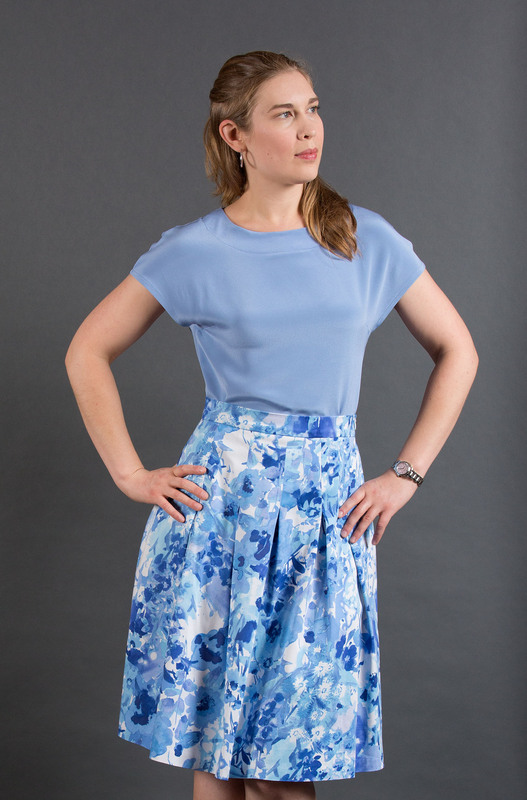 The Style Arc Skye top has cut-on sleeves, two bust darts, and a center back seam. 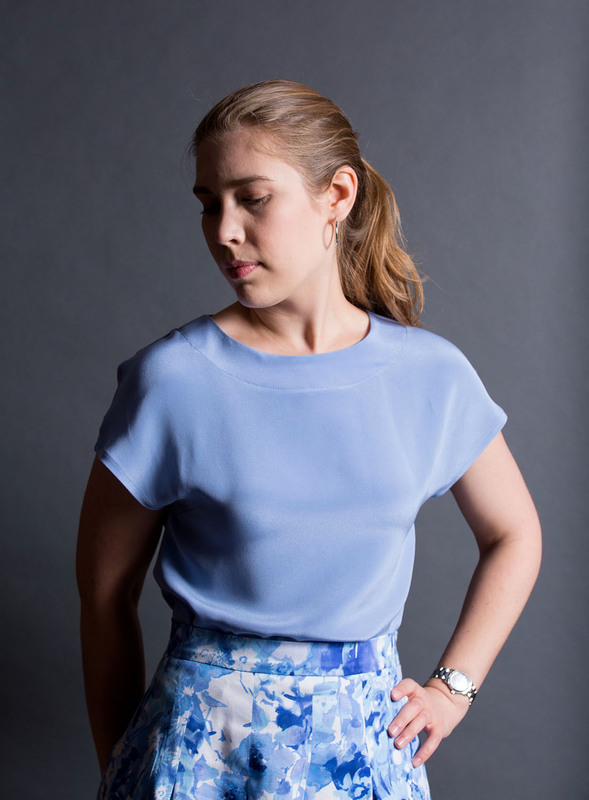 The neckline and curved hem are finished with topstitched facings. The length falls at around high hip level for most people. I used this 4-ply silk crepe from Fabric Mart. Style Arc doesn’t recommend one particular fabric for this top. For the back closure I used an orphan button from my stash. 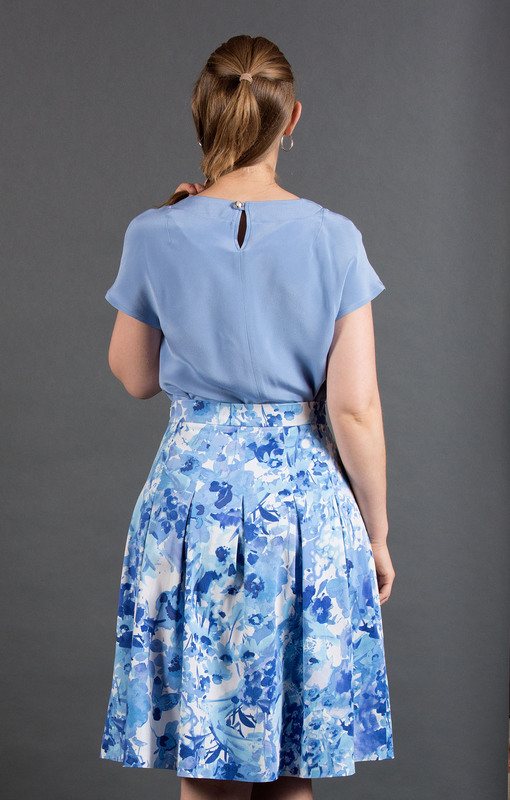 While Style Arc includes a pattern piece for the back button loop, you can also use a hook and eye. After making this I realized the bust darts are probably about 3/8″ too high. Judging from the other Skye tops I’ve seen the bust darts are drafted a little too high for most women. Definitely check the dart position before you sew this! If you are a pear or hourglass, you’re probably going to be happiest tucking this into a high-waisted skirt. And if you do tuck it in, you should consider lengthening this top a couple of inches. 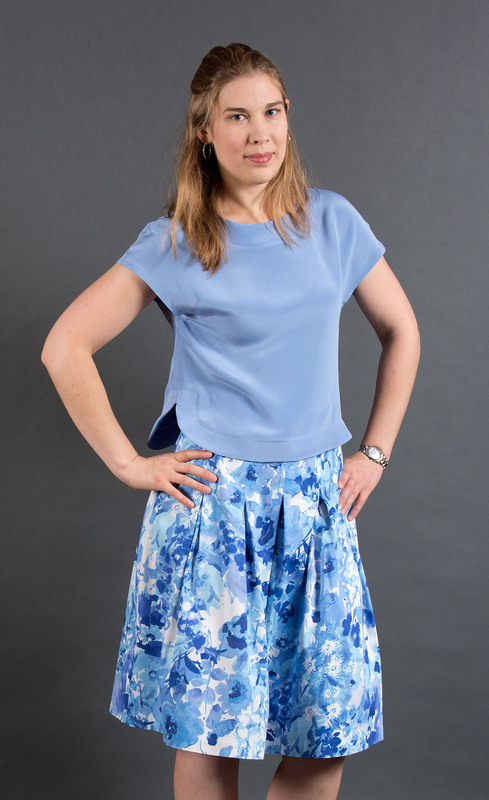 I just barely got away without adding extra length, and that is only because the skirt I am wearing with it (the Style Arc Candice) has a 1.5″ waistband and the bottom of the waistband sits at my natural waist. I also have to be mindful during wear. For the sleeves I just folded back and topstitched, as directed by the instructions, and IMO it is a little bit too “homemade” because the sleeve is short and not extremely fitted, so bits of the wrong side peek out at times. I don’t think there’s anything wrong with serged seam allowances, but at the same time I feel like they are best reserved for seams and hems that aren’t publicly displayed during wear. If you think this will bother you, plan on cutting out some bias binding strips out of a lightweight fabric to finish them off. This weekend I also fixed my Candice skirt. I ended up ripping out the invisible zipper and waistband (ugh), shortened the waistband 1.5″ (which essentially brought it back to the originally drafted length), and resewed the hip curve to match. I’m much happier with the skirt. I feel like it hits a more flattering point on my torso, and it brings the hem up to my originally intended length. Definitely worth the extra time it took to fix. I shot these at f/8 or f/9, ISO 400, using my Canon 70-200 f/4L IS lens. Shutter speed varied – some were at 1/60, others at 1/80, and a couple at 1/125. As I mentioned in my first sentence, this is my first project photoshoot with my new studio strobes. I positioned two strobes at a 45″ angle from where I was standing. One strobe was set at a lower power than the other. The more powerful strobe was aimed into a 60″ silver umbrella. (That was my key light.) The other strobe was meant as a fill light, so it was set at a weaker power, and aimed into a much 36″ white umbrella. For some of my photos I forgot to turn off an incandescent lamp near the camera, so the definition isn’t as good as it could have been, and for others I had the fill light set too powerful. 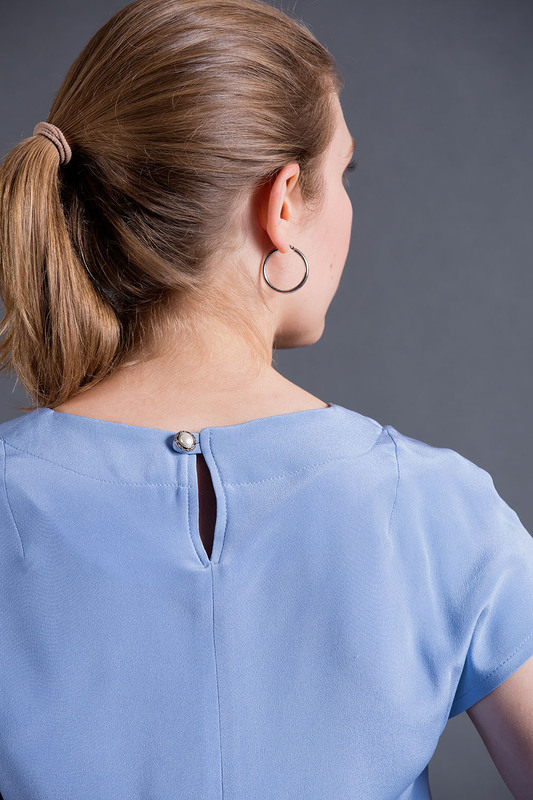 My “secret” to the studio background look is good cropping and Savage seamless background paper. This paper comes in several widths and around 40 different colors. Since space is such a priority for me I stick to the 53″ width. I used Thunder Gray for this particular photoshoot. I love this stuff. It is fairly inexpensive and comes on a big roll, so if you stand on it with muddy shoes you can just cut that section off and unroll some more. Easy to handle, and unlike traditional muslin theres on need to steam out wrinkles. I got mine from B&H. After I mounted it on my backdrop stand (which is stabilized with the help of some sandbags) I untaped the edges, pulled them down, clamped the top of it once I had pulled enough off the roll, and secured the bottom edge with a small floor mat. With the exception of resizing and converting from a RAW to JPG file, this photo is straight out of my camera. Kind of crazy how, with the help of some cropping, it transforms an ordinary living room into a “studio”. Great photos and a nice setup. 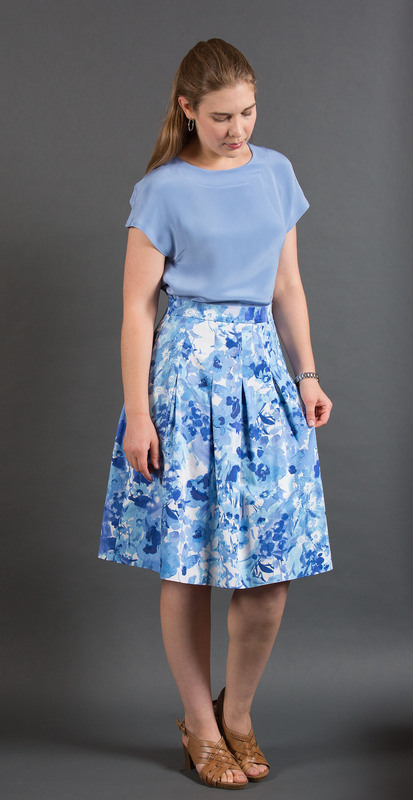 The blouse and skirt look great together, but yes tucked in looks much better. It’s a becoming look on you. Thanks. I mostly included the untucked photo so people could see the actual length. While I love the untucked look on other people it is not for me. 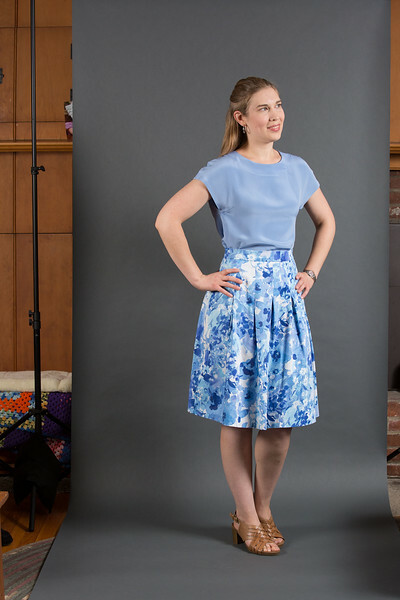 Great work Anne…the sewing, the set-up, and the photography! Thanks for sharing in such wonderful detail. You continue to grow in so many directions! Thanks Anne. I love learning all I can! I really like how the Candice skirt is sitting. Is the waistband a rectangle, or does it have a bit of curvature to it? It is something that gives me great joy. I remember the older issues of Burda (back when it was Burda World of Fashion) used to do a little bit of these types of shoots – have the stylized photo, then some nice close ups. That’s what I am trying to emulate. I really love reading about your photography techniques. You are getting really good! Lovely outfit, too. That color suits you, and I like the neckband facing. great color on you, lovely blouse. and fun plus interesting to hear the photography details. Beautiful blouse. I love the color coordination with the skirt. It looks great tucked in. Your photography work is so professional. It is fashion magazine quality! I love this out fit on you! Beautiful shape, refreshing flattering color! And yes, tucked in just looks more finished and shows off the skirt. Sigh, now I’m inspired to make something similar. Awesome to see how your photography skills are developing Thank you for sharing the details. Your outfit is lovely. I agree that the top looks better tucked in. I hope that things will finally work out for you and that the rest of the year will be better for you.